As we prepare for the re- opening of the west Cast Court in autumn 2018, this blog will take a closer look at ten key casts on display in the gallery, exploring the object’s history and providing insights into recent conservation work. The first post in this series is about the cast of part of the interior of the Rosslyn Chapel (Repro.1871-59). This cast was bought by the Museum in 1871 from Messrs Franchi and Son of Clerkenwell, London for £76 and 5 shillings. 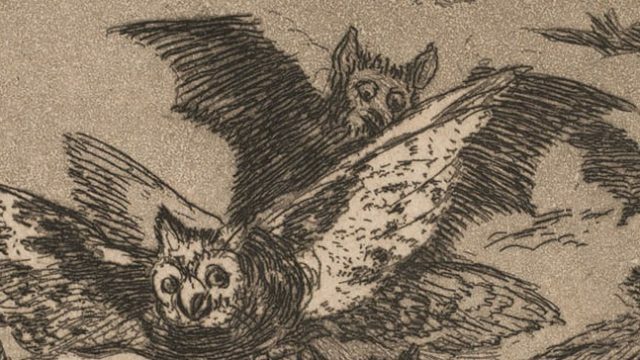 Giovanni Franchi was the founder of a successful firm that specialised in making fictile ivories, and plaster and electrotype copies. He was the first person in the country to cast from gelatine composition moulds, and he perfected the means of casting from the round in moulds. The firm made a great number of the casts in the museum’s collection, including the Gates of Paradise (Repro. 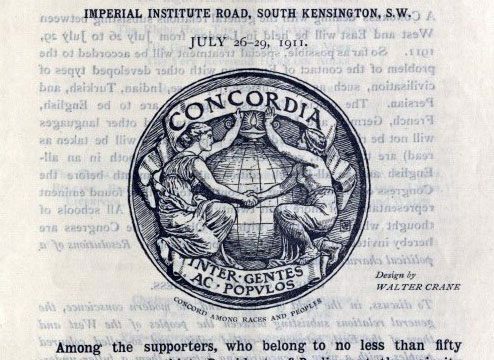 1867-44). 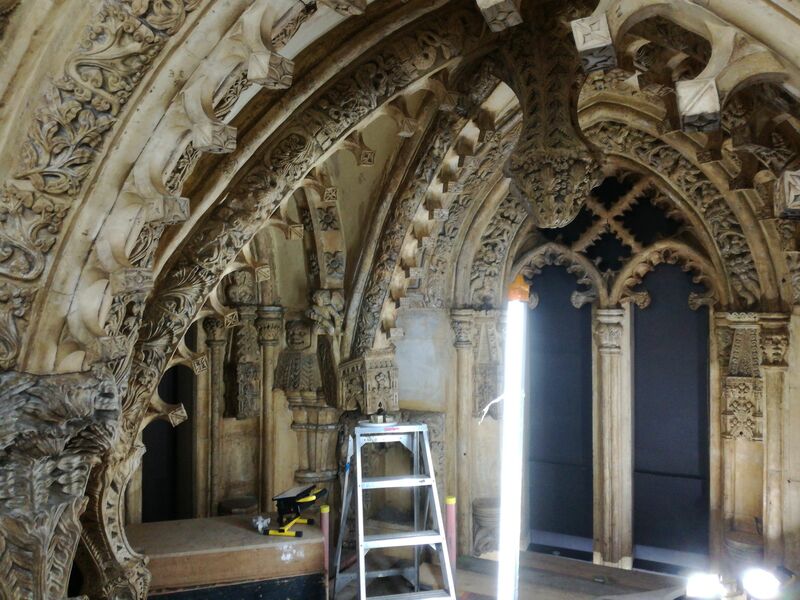 Scaffolding around the cast of the Rosslyn Chapel has allowed conservation work to take place. This cast was executed by the firm in 1871 and reproduces part of the interior of Rosslyn Chapel in Roslin, Midlothian, Scotland. The Chapel was founded as a Catholic collegiate church in 1446 as a place of worship. After the Scottish Reformation in 1560 the chapel was no longer in use. In 1861 the Chapel was re-opened for public worship, and was visited by Queen Victoria in 1862. 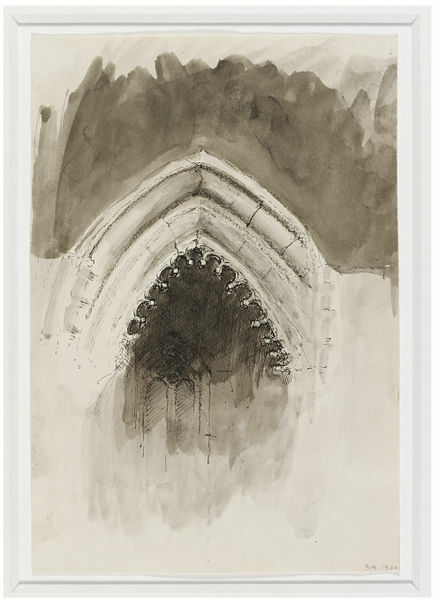 The Rosslyn Chapel is considered by many to be one of the best examples of Scottish architecture, and thus the cast was an important acquisition to the museum’s collection. The original Chapel stands on fourteen pillars, which form an arcade of twelve pointed arches on three sides of the nave. The cast reproduces only one section of the Chapel, but does include a cast of one of the most notable architectural features, the ‘Apprentice Pillar’ or ‘Prentice Pillar’. The pillar was originally called the ‘Princes Pillar’, but the name morphed over time as a result of a legend dating from the 18th century. According to the legend, the master mason did not believe that the apprentice could perform the complicated task of carving the column without seeing the original, which had formed the inspiration for the design. The master mason travelled to see the original, but upon his return was enraged to find that the apprentice had completed the column. The legend goes that in a fit of rage the master mason took his mallet and struck the apprentice on the head, sadly killing him. The ‘Prentice Pillar’ was cast by Messrs Franchi and Son, and expertly reproduces the pillar’s infamous carving. The ‘Prentice Pillar’ and the lower half of the cast. A conservator working on the cast. The cast also reproduces some of the many intricate carvings and mouldings which cover the Chapel’s ceiling and archways. In order to begin making a cast, plaster moulds must be taken from the original. 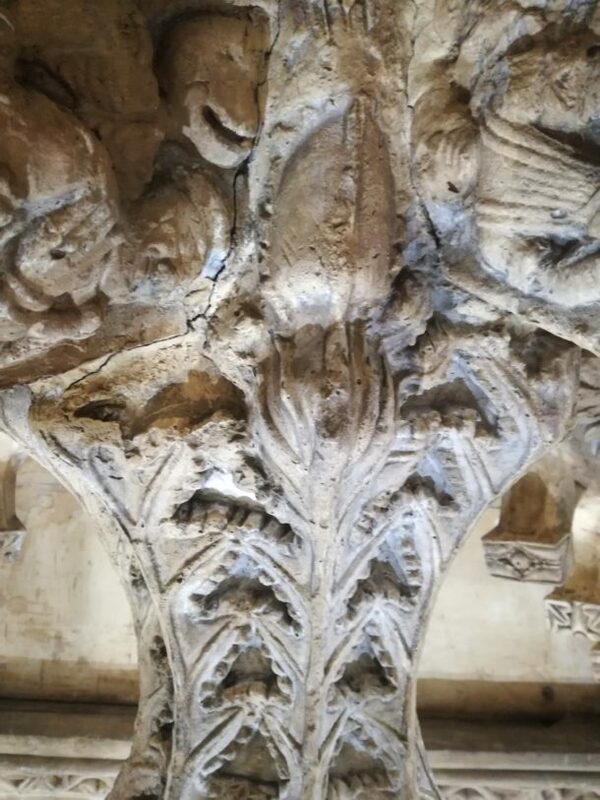 For object such as the Rosslyn Chapel, where there are a lot of surface projections, moulds were made in many pieces to allow these to be undercut. 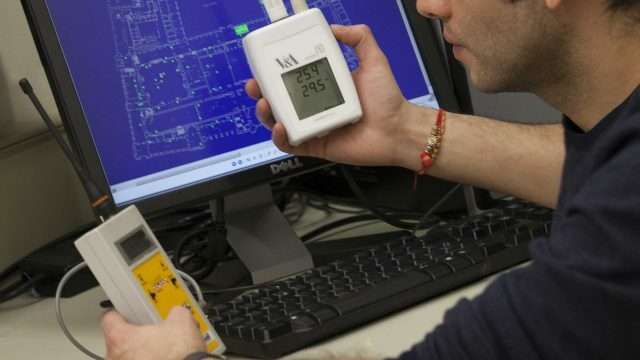 The more moulds there were, the more complicated the process. The piece moulds would then be enclosed in an outer casing, the interior coated with a separating agent, and the wet plaster poured in. The divisions between the piece moulds produce a network of casting lines on the completed plaster cast. This casting process required great technical skill, and thus the reproduction of the Chapel’s highly decorated interior demonstrates formidable technical achievement. It is unknown whether the carvings have any particular meaning attached to them, but various suggestions have been proposed. 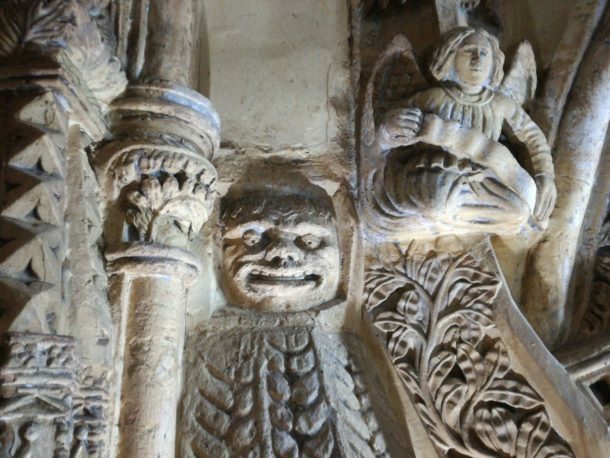 The image of a ‘Green Man’ appears over 100 times throughout the chapel. The Green Men are carvings of human faces with greenery surrounding them, and often growing out of their mouths. Other carvings represent plants, including depictions of wheat, strawberries and lilies. 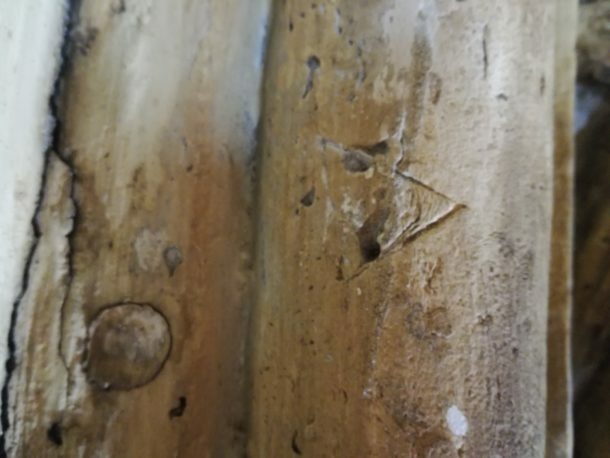 While the scaffolding is up, V&A staff have had the opportunity to take a much closer look at the cast, in particular a series of makers marks which were copied from the original. 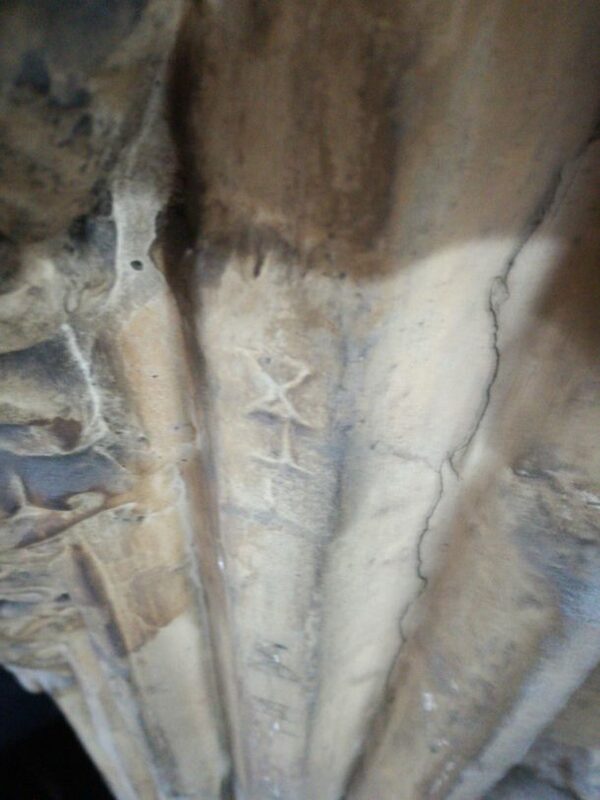 These date from when the Chapel was made and were marks left by the masons on the original stonework to record their work. 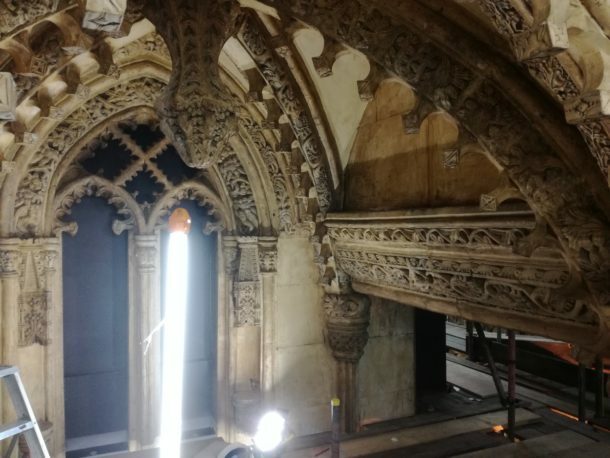 This week electricians have been working in the Cast Courts preparing new object lighting for the gallery, and have installed several new lights around the cast of the Chapel. 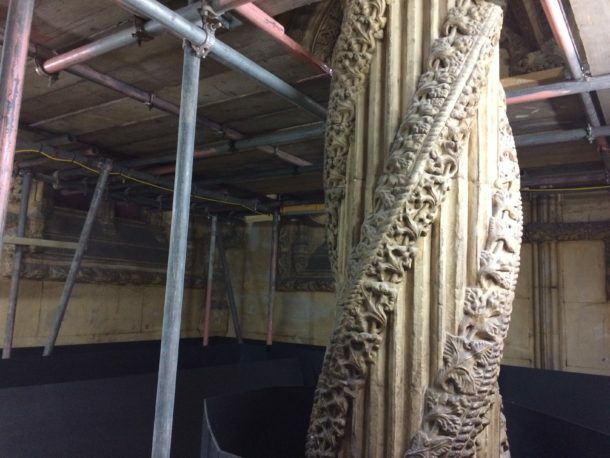 Conservation staff have also been concluding their work on this cast before the next section of scaffolding is struck. 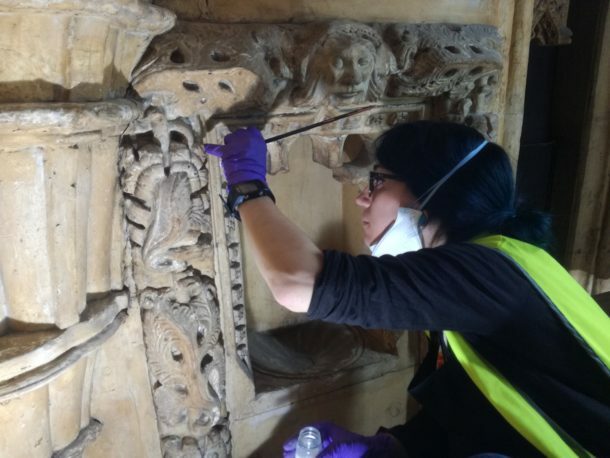 In a few weeks time Johanna Puisto, a Sculpture Conservator at the V&A, will conclude this piece on the Rosslyn Chapel and will discuss the process of conserving the cast. Find out more about the Cast Collection on our collection webpages. I am an Assistant Curator working in the Sculpture, Metalwork, Ceramics and Glass department and am currently working on the Cast Courts FuturePlan Project.